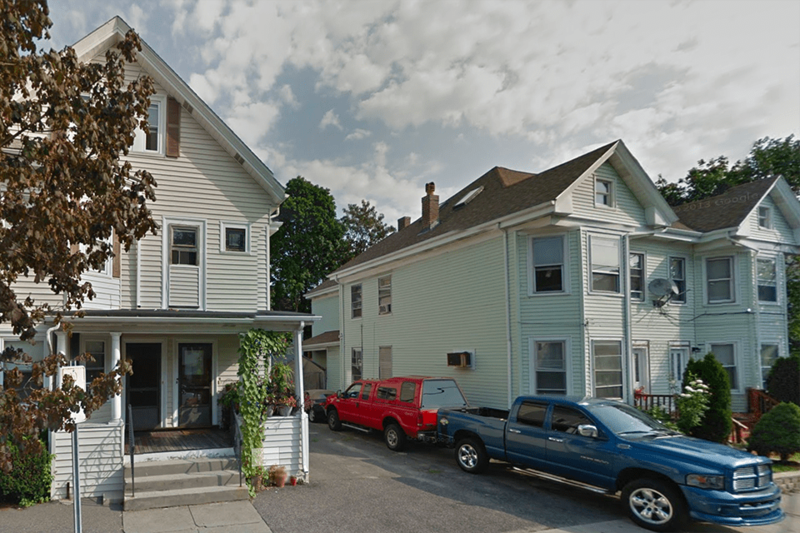 This two-family house on Dartmouth Street in Waltham is typical of the local housing stock available to graduate students. Due to the overwhelming demand for undergraduate housing and the university's limited supply of housing stock, graduate students are typically not housed on campus. However, Greater Boston encompasses a wide variety of neighborhoods that are within easy driving, biking or commuting distance to campus and offer an array of shopping, dining and entertainment venues. Residential. Affordable. Foodie destination. Car not necessary but helpful. Waltham, home to Brandeis and Bentley universities, is 9 miles from Boston and has two stops on the MBTA Framingham commuter-rail line. The southern section comprises mostly multifamily housing, while the northern section has larger single-family homes. Waltham is home to 11 parks, a large shopping district and one of Greater Boston's best food scenes. Approximately three-quarters of Brandeis graduate students live in the city. Visit the city of Waltham website. Urban feel. Affordable. Student-friendly. Car recommended. The Allston and Brighton sections of Boston offer residents an urban feel and access to numerous bars, restaurants, coffee shops and parks. Many university students and young professionals live in the area, which is just a short train ride from downtown Boston. The areas have a reputation for being student-friendly and safe. Approximately 10 percent of Brandeis graduate students choose to live here. Active nightlife. College students/young professionals. Moderately expensive. Car not necessary. Cambridge is the spirited, more playful side of Boston, located just a bridge away on the other side of the Charles River. Packed with international flair and a youthful vitality, Cambridge is a city where a counterculture lives, classic culture thrives and multiculture is a way of life. More than 50 languages, from Spanish and Creole to Chinese and Korean, can be heard on the streets of the city. The eclectic Porter Square area is about 15-20 minutes from Brandeis and 10-15 minutes from downtown Boston via public transportation. Visit the city of Cambridge website. Active nightlife. Students and young professionals. Expensive. Car not necessary. Downtown Boston is the financial hub of Massachusetts and home to an eclectic mix of restaurants, shops, parks, cultural venues and historical sites. The city streets are bustling with young professionals and students, many of whom live or work at Emerson College and Suffolk University. Most of the area's residents are renters, but intense competition for the units has driven up prices. Downtown Boston is extremely walkable and accessible by all forms of public transportation, making it possible to get around without a car. Residential. Expensive. Low-key nightlife. Car recommended. Newton is a western suburb of Boston composed of 13 separate villages, each with its own distinct character. Bounded by the Charles River, the city has an award-winning library, a thriving arts and cultural scene and a wide variety of boutiques, restaurants and stores. With a limited stock of apartment units, rents are moderately high. Many parts of the city are accessible by public transportation, including the Green Line "D" Branch train, the Framingham/Worcester commuter rail and many bus routes. Visit the city of Newton website. Residential. Moderately expensive. Moderate nightlife. Car not necessary. Somerville is an up-and-coming city northwest of Boston with a diverse mix of blue-collar families, young professionals, college students and recent immigrants. The Davis Square area is an extremely popular neighborhood for students and young professionals due to its proximity to Tufts University. Davis Square is just a short walk to the Porter Square T stop, which has direct service to Brandeis via the Fitchburg commuter-rail line. Rents in Somerville — and especially Davis Square — are moderately expensive. Visit the city of Somerville website. Residential. Affordable. Low-key nightlife. Car recommended. Watertown, which borders Waltham to the east, is a family-friendly residential community that offers a quieter existence than many of the other urban areas surrounding Boston. The city is home to two major malls and other shopping venues as well as many parks and passive green spaces. Approximately 3 percent of Brandeis graduate students live in Watertown. The city is about 20 minutes from Brandeis via car and is accessible by bus from the Alewife stop on the Red Line. Visit the city of Watertown website. The graduate housing Facebook group is great place to view and post housing opportunities. Find affordable housing, housemates and roommates by subscribing to the listserv. Send an email to gradhousing@lists.brandeis.edu to share a posting with other listserv members. Enter a title for your posting in the subject line and attach up to six photos. Our office works closely with several real-estate agents in the Waltham area who have a proven track record providing excellent customer service to our graduate students. Please refer to the agents below for additional assistance in your search for housing. They each are knowledgeable about the specific needs of Brandeis graduate students. The Office of Graduate Student Affairs provides information to students as a courtesy to help with finding suitable housing for students attending Brandeis University. The information is for the use of Brandeis students and is only updated periodically. Brandeis University accepts no responsibility for the reliability of the information provided or those listing with the department. Contact with persons listed herein will be conducted independently of the university. Brandeis University will not be involved in any negotiations between you (the leaseholder) and any land owner, property owner, student, prospective student or realtor.